Steve: Welcome to all of our Becoming Your Best podcast listeners, wherever you might be in the world today. This is your host Steve Shallenberger. We’re delighted to have you tuning in and today we have a terrific guest. She is an innovator, a catalyst for transforming organizations into brands that matter. 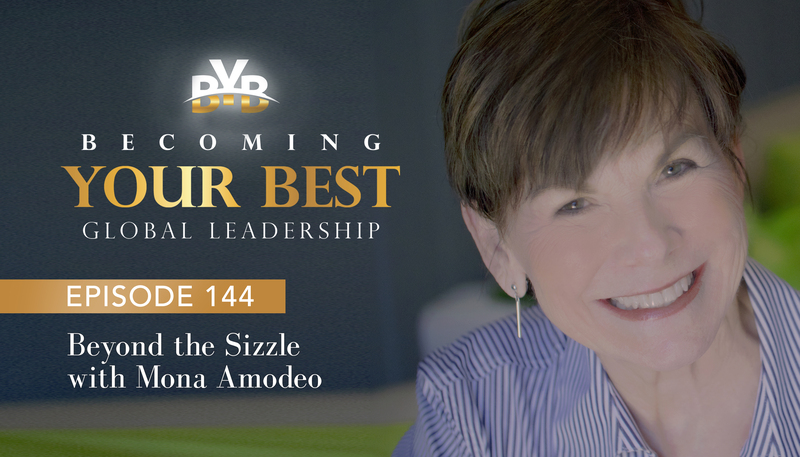 She’s an award winning management strategist and a recognized expert in organizational development and change on a mission to move business as is to business as it can be. Her work spans the boundaries of scholarship and practice in the disciplines of branding, communication, and organizational culture. Welcome, Mona Amodeo. Mona: Oh, thank you so much for that sounds like I’m a little confused about who I am and what I’m doing. I’m spanning all those disciplines through life’s journey. Steve: It is. Well, that’s how we get to where we are today. Mona: Yes, yes, for sure. Steve: Well, good. Well, before we get started, I’d love to hear a little bit about your background, where you’re from, what’s your story and what brought you to this point. Mona: Yeah, great. Thank you so much and again thanks for having me here. I look forward to the conversation with you. So story really is reflected in that little bio that you just read. I started out as a former instructor and documentary producer at the University of West Florida. Through a series of events and situations, I decided that perhaps doing something other than that was what I wanted to do in life. And so I started a business in 1989 and that businesses is Image Development Marketing Group was what it was called then. Today is ID Group and we started out really taking some of what I had done at the university, which is really storytelling and figuring out how we might do that for companies and organizations. And in that process, Steve, I became also very interested in the power of business to really make a difference, a difference in their communities, a difference with the people who worked in organizations. And that led me to really wanting to study more about organization change. How do we really create organizations that are powerful not only from a profit standpoint but also one that supports the health and well-being of the people inside the organization. And so from there studied organization development and change which led me to a research project with a global manufacturer by the name of Interface in Atlanta, Georgia. I had a real opportunity there to study how a leader changed a culture, this is from a really traditional mindset of take, make, waste manufacturing, traditional manufacturing entity to one that really became one of the exemplars of sustainable manufacturing. Spent several years with interface not working for them but doing research and then consulting. And then so this book really is the culmination of what I’ve learned about how to build brands from the inside out. And if we really think about brands, it means it’s really the definition is, what do you mean to people? And why do you matter? And that’s the name of the book. Creating brands that matter to customers, employees in the world, at least the subtitle. So that’s the short version of a long story. But ultimately, my work today is centered around helping leaders build as you said, brands that matter. And doing that in a way that is not all about the sizzle of advertising but rather the substance of who you are, what you believe and the difference you want to make in the world both to your customers and employees. Steve: Okay, good. Well, that’s a great background. And we’re going to talk a bit more about that. And Mona has written a terrific book and it’s called Beyond Sizzle. She just alluded to it but I didn’t talk about it in the introduction. But it’s a fun book and really stimulates you in thinking about our whole role and let’s face it, for anybody that has an idea that they want to be successful with, they have to differentiate that, there’s a lot of noise out there going on. So how do you communicate that? So I think Beyond Sizzle really hits at the roots of this and one of the things that Mona talks about is the story and it had a big impact on her. And I think it’s worth taking a second or so Mona to talk about the story because it gives a little background to this and then we can talk about some of the specifics, if that’s okay. Mona: Yeah, so thanks. And I did allude that a little bit in talking about the company by the name is Interface and a man by the name of Ray Anderson who was the founder of interface and it was there in that research project where I really began to understand the power of purpose in organizations. I guess, at some point, you know, I always say, I’m a child of the 60s. And we talked a lot about purpose and passion, all those things in the 60s. But yeah, this is a very interesting opportunity to go inside of a company and really look at how a company changed from the inside out. And the opportunity there Steve was to interview people over there that had been a part of this change process at Interface. And my question going in was simply this, I had been inspired by companies like that Ben and Jerry’s. I have been inspired by, you know, Anita Roddick at the body shop. And companies like Seventh Generation, who really were using business as a mechanism for sure making money, but also doing it differently than other people that really focused on doing the right thing, doing the smart thing, treating people well and making a difference either environmental or socially. And so those people inspired me a lot. But I wondered, well, what if you have a company that wasn’t born with that DNA? You know, those founders really started their company from scratch with that idea. So what about a company that isn’t born that way? Can you change it? And if so, how? And that led me to again, Interface the great opportunity to work and learn from Ray Anderson, who passed away in 2011. And to him, this is one of the people my book is dedicated to. And what I came to find was something that sounds so common sense but yet we fail to really pay a lot of attention to is that, when you’re trying to create great companies, people want to work for something that matters to them. They want to believe in something and they want to be a part of something that’s important to them. And what Ray Anderson did was, he challenged this very traditional manufacturing company to be the first name and sustainable manufacturing and to do so not just in words but in deeds. And so over about a four year period, they literally transformed this organization, both in substance and the soul, if you will, into a company that really changed the dynamics and the definition of sustainable manufacturing. And so my work looked at how did they do that and what was the process. But in the middle of all that, I came to see that it wasn’t just what was happening inside the organization and the impact it was having on people inside the organization but how that purpose trend was translating also to the marketplace. People wanted to work with Interface. People wanted to come to do business with Interface. And so this whole idea of this alignment between internal purpose and values, innovation, and how that connects to creating meaning in the marketplace is what I learned there. And from there, then I started thinking, Okay, how can I translate this is into something that can help other people do what Interface did and that’s where the concept of becoming a brand that matters came from. And using that research, as well as some other research I’ve done and others have done. I basically created a process that we use with companies to help them build brands from what I consider the inside out. And that’s called branding from the core. And so that’s kind of it. And that was yes, it was one of those moments in your life where you look back on and go, “Wow, that was pivotal”. And that was 12 years ago. And since then, we’ve been kind of working to help other companies do what Interface did, which is to be profitable, to be purposeful, and to leave the world a little better than I found it. Steve: Okay, so Mona, thank you so much for that background. I think that was helpful and really give some key insights to a lot of your work and what inspires you. Has it been your experience from your research organizations that organizations that do this, that are able to align their core with the message of what the product or service they provide, does it really make a difference? Can they, are these companies actually able to do that to be successful, to get profitable results, and sustainable and to make a difference? What have you found? Mona: Yeah, so I think what we need to do is go back to very simple premise. Business exist to meet the wants, needs and desires of a marketplace. And what we know today from various studies, pickup fortune, pick up any of the major business magazines as well as a lot of research is being done, is people want to do business with and work for companies that stand for more than their products and services. It is a driver of reasons people buy products and services, and also with a new generation of employees, they want to feel that what they do matters. And so from a pure, just basic 101 standpoint, how do we attract and retain customers, employees; we understand that this idea that your organization has great products and services. I always say you can’t make money purely on purpose. there’s plenty of detailed research out there but just on a very practical sense; If you have a choice between being a company that destroys and creates environments where people are not treated with respect and dignity versus one that , wouldn’t you want to have that and then if the research clearly shows that those companies perform better, do better are more innovative, retain employees better, retain customers better. It just makes sense. So the answer is, yes. There’s plenty of research out there that shows that and then just from a pure leadership perspective, leading those kind of companies also reinforces the integrity and pride of a leader. Knowing that they’re leading those kinds of organizations and not one that’s destructive. Steve: Well, we totally concur. Oh, and thank you for sharing that. Because that’s exactly what we have seen in the marketplace. These organizations exercise leadership, where they set a vision for their organization and have a plan that’s in line with a passion, with the desire to change the world for good and then that’s reflected in the culture. The very same feeling that that vision and purpose permeates every part of the culture, which then unleashes this kind of magic, which creates the ability perhaps to communicate better what that sizzle looks like. That it’s not just a product but it’s- you know, soul and heart and everything else. And, and so it’s it is authentic, I mean, people feel this. Mona: I think what’s really important there, you just said the word authentic, right? There’s two kind of key words today as we look at the world of communication and branding because if we pause here a moment just to kind of look at this word branding, because everyone has a different definition of what that means. For me, a brand is simply the meaning people associate with your name. Branding is the process of creating that meaning. In the past, what we’ve done is most of our efforts to create that meaning, that brand, if you will, has been focused on external communications; the sizzle, the great advertising and all of that is still important. I mean we have to, people can’t buy what they don’t know about, right? And that’s the role of advertising is to share the story but increasingly, what we’re seeing is that people want to understand what’s behind all of that, they want to understand the authenticity of what you’re saying you are. And I think that’s what’s so important about what you’re doing with your work. And what I’m trying to do with mine is to say, you know, we don’t live in a world any longer, where people just believe what they read, you know, with the interconnectedness of the internet, you know, that people are increasingly skeptical on top of that. And so this idea of aligning who you say you are, with the substance of what’s happening in your organization is crucial to building the success that businesses need to build. So I think your words those transparency, authenticity is important, and you can’t fake that. You just can’t fake that. I mean, because your best advocates are the people inside your organization. The people who helped shape and share your story are the people inside your organization. So the more honest you are, the more forthcoming you are, with trying to really build that culture where the values that you profess are actually translated to behavior is absolutely critical, in my opinion to building brands, meaning the meaning that matters in a way that that people trust you. And that’s what all of this is about is creating trust. Steve: Okay, that’s really terrific. And you mentioned that there are some really powerful disruptive forces that are challenging the bonds of press that’s needed to create strong corporate brands. Can you talk more about those? Mona: Yeah, I just alluded to this a little bit, Steve; I think there’s three of them. And they’re coming at you from different levels. So at one point, you have this extreme skepticism. People just don’t believe for good reasons corporate communications. I mean, if we look at some of the deception that has gone on, people don’t trust, and so this idea that increasingly, we are seeing a skeptic society that is demanding, prove it, number one. Number two, we live in a very hyper connected society where anything that you do and say is likely to show up with you know, on Twitter and Facebook and everything else and so just the nature of the hyper connectedness that we are at one point in our world of branding, you have these brand managers back in the days of the madmen, and the great days of advertising in the 50s. All of those guys control both the message and the medium, today that’s not the case. We live much more in a matrix of communication, where the control really to a large extent is in the hands of the marketplace, and their ability to share good and bad is just exponentially growing. And then the third piece you and I just alluded to, in our conversation earlier, is that people want more from organizations and products and services. Frankly, there is a great deal of parody. And so why should I choose this over that? And to a large extent, it has to do with the values and the purpose of the companies who produce those products. You know, are these companies good citizens are they just take and there’s no real social contract that right, we just take, we use the money, you know, the people at the top make everything and everybody else is left with a crumb. So I think those three forces the skepticism of society that’s continuing to grow, the hyper connectedness that is being increasingly propagated through the internet, and the third thing is that people are looking for companies that stand for something. So you put all that together even if you want to say you stand for something, you better stand for it, because now people are skeptical, and they can either sing your praises or destroy you via various social media channels. So the people are in control. Our job is to make sure we deliver great messages, we do things that matter, and we make sure we live and walk the talk that we put out there. Steve: Well, Mona, one of the things that you talk about, one of the words you use was having loyal customers. And indeed, today’s customers, once you have their loyalty they’re far more patient with you, because they understand who you are. But the consumers of today, you’re right, the world’s change, they’re far less patient. If they sense that you’re not honest or if you can’t deliver or are not providing a great value, there’s a lot of other choices frequently and they’re going to go there. But once we have a loyal customer base, they frequently will stay with you through thick and thin as long as you can deliver on those kinds of things. They’ll share your passion, and you know that and they’ll want to be part of it. So, okay, well, good. Just a quick question. This is what happens if a company is having a hard time figuring out how to describe the sizzle? What do you recommend to them? Mona: Yeah, I think the sizzle when you say, you know, they’re having a hard time telling their story, basically. And I think the difficulty of telling that story maybe is that they don’t know what their story is, and nor do they understand where they fit within the marketplace. So my belief system is that the story begins inside the organization. And so when we start and work with our clients with helping them kind of create the sizzle so to speak. We start with really dialogue sessions inside the company, asking the people inside the company, what they believe? What makes you unique? What makes us different? What makes us better? What difference are we making it the world? And so the story, the narrative that the organization tells itself is really where all of this starts. And so I think that what’s really important when you think of the sizzle, the sizzle translated really, Steve, is about what is it that matters to the people that you’re talking to, and you’re talking with, and the more authentic you can be about who you are, the sizzle is, is in many ways, for me the authenticity of your story. You know, if we just break this down and say this is all about relationships. Think about people that you like. Think about the people in your world. Forget about business for a moment. Just think about the people in your world that you choose to talk with, that you choose to have a relationship with. What are some of the foundational things that that that create those relationships? You look for things that you have in common, you listen, you share ideas, you talk about hopes and dreams, you stand behind a promise that you make and it’s really that simple and that complicated. And I think sometimes those of us in the branding world that communicate, we got to do six of this and five of that for these, and we’ve got to measure this and measure that, and it can just get overwhelming when we really if we take it down to the very simple human interaction. That interaction between, I want to understand you, you want to understand me, there’s something that we can do for each other. And you can trust me that if I say, I’m going to do something, I’m going to do it. And so it’s those kind of human connection that the story has the ability to create. And so when we go back to this idea of authenticity and transparency, it’s not let’s go figure out what people want and tell whatever they want. The answer becomes what is it we want to share with the world? And what is the world looking for. It is that what we call the sweet spot of branding where we connect with what people need, want, and desire and what we believe we can bring to the world. So that’s where the authenticity comes from. It’s not, let me just be anything to everybody and say whatever is needed. What’s the latest buzzword? All of that is what can destroy, I believe, a brand. On the other hand, it’s when you really stay true, and tell the story around that truth and authenticity and you will connect people to you using that type of “sizzle”. Steve: Okay, I love the answer. That’s a great answer. Well, I’m always shocked at how fast time goes and our times up. And this is a fascinating book folks. It’s Beyond the Sizzle. And the bottom line is today, it isn’t enough to sell just the sizzle. There’s a whole lot more that goes into it that really allows us to create this sustainability. This long term impact in the world for good. So before we sign off Mona, any final tips that you’d like to leave with our listeners today? Mona: Yeah, I think Steve just I think in summary, I think I wrote this book after being in business for 30 years. And I believe very deeply that the world is looking for companies who stand for something and stand behind what they stand for. I believe employees want to work for places where they believe they matter. And I believe leaders have a tremendous opportunity to do both. Create a difference in their communities and the world, create a difference for the people they serve, and in the process of doing so build a company that is prosperous. And so that’s my hope that we’re able were able to do that. Steve: Okay, well, great. And how can people find out more about what you’re doing? Mona: Thank you. So you can reach me at Monaamodeo.com, and the book Beyond Sizzle: The Next Evolution of Branding is available at presale right now on Amazon.com, and it will be released September the fourth I believe. So we’re looking forward to that. And I really, really appreciate the opportunity to talk with you and for you to help me spread the word. And again, I respect everything you’ve done. Thank you for what you’re doing to create a more positive business environment. Steve: Oh, you bet. There we go. September 4. How exciting! I bet you’re pumped! Mona: Yes. Yeah. Yeah. Well, it’s always a little nervous. So hopefully I’ve said something that will be worth people reading in and then I can make some contribution to what I’m trying to do here. Steve: Well, congratulations. And we wish you all the best as you continue to make a difference in the world. And to all of our listeners. Never forget you too are making a difference every single day of your life. That’s really the heart and the spirit of becoming your best. We just keep at it, we keep trying to make our good better and our better best and what happens is in the process we touch a lot of people for good. Thanks for being with us today. This is Steve Shellenberger with becoming your best global leadership. Wishing you a great day.